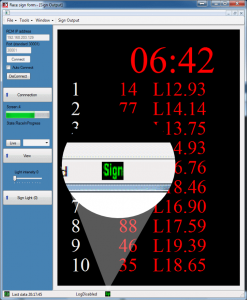 RaceSignBoard is the free software package that connects the RaceSign board with the RCM timing program. 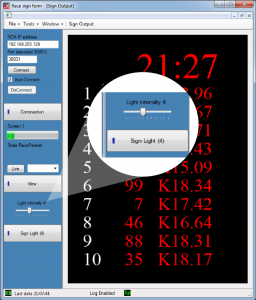 With this software, you can configure the output of the sign with a long line of features. Check some of them out in the list on the left. In the bottom left corner of the application, there is a clear indication of the RCM connection status. A combination of graphic indication and a timestamp showing when the last update from the timing software occurred. Ordinary communication disabled for firmware upload or test. A slider in the main screen set the light intensity in the sign. The panels update immediately with the new light settings. In the left side of the main window, there is an indication of what RCM race state is active and which screen is displayed. This indication also shows when the next screen is displayed. 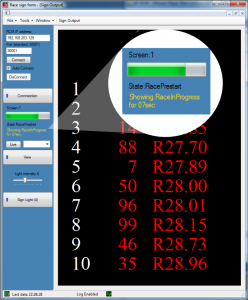 If there is a need for showing custom data between states, a custom screen can be configured, showing e.g., best lap time or total laps after a race in the certain period of time. Race data from RCM is frozen during this transition state. It’s possible to overwrite the current state from RCM. Any state from RCM can easily be selected from a dropdown meny. 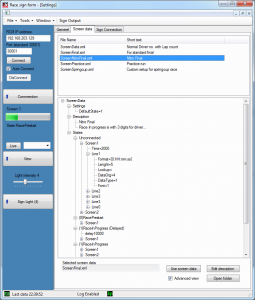 State overwrite is only available during online with RCM timing software, as source for data. Static screens (bottom half of list) is always available. 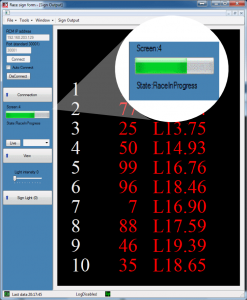 Unlimited number of screen configurations can be stored and selected in the program. Each screen file contains the script for the behavior of the sign: What data to display, for how long and at what event. These script file can be modified to fit your needs. 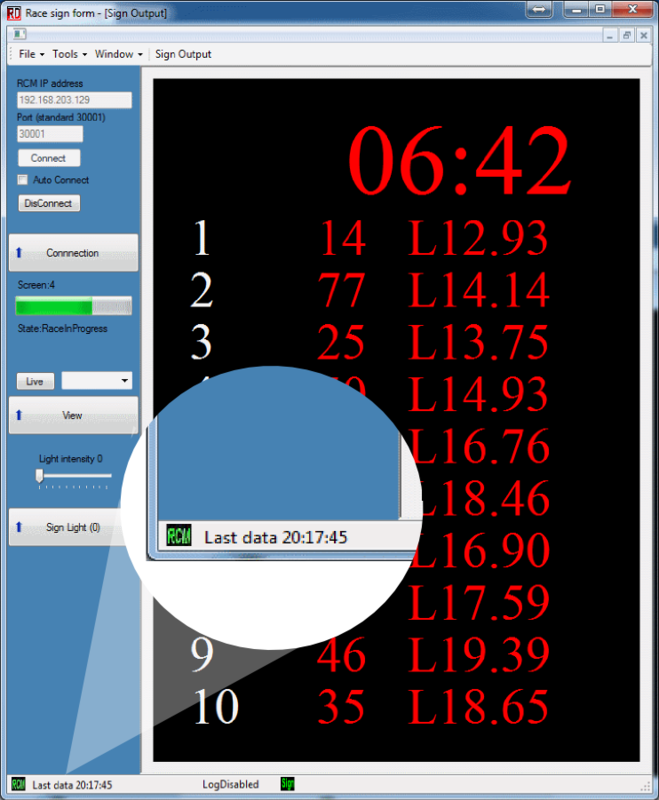 The content of the screen file can be browsed in the data tree to give you an idea about the data being displayed during your event. 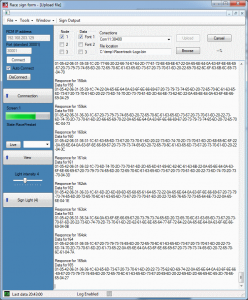 This feature gives the user a snapshot of the data sendt from the RCM race. 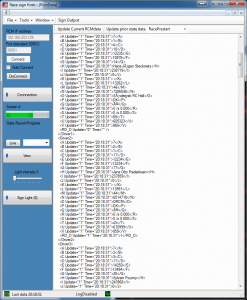 this makes checking the RCM configuration easy, and could quickly locate any wrong setting in the RCM timing software. It’s possible to see the last data sent in a particular state. All data is marked with a timestamp for last updatet by RCM. The program scans the computer for available com ports. The default baud rate (communication speed) and timeout is already configured for appropriate settings. There is a clear overview of the quality of the communication. A timeout counter for each panel shows the integrity of the connection to the sign. Disabling the response from the panels, will reduces delay between them and make the 3 panels appear as one big unit. Overview of different commands the sign supports. This window can be used to test your sign or help you understanding the protocol for developing purpose. A table showing overview of data sent to and from the sign during testmode. You can write your own text and send it to the sign. You can announce breaks, practice and races on your sign. The text can be stored and reused when required. The top line can be used to show e.g. time in dobbelt size font. Different fonts can be loaded including the build in graphics, with the option to offset or center your text. It’s possible to upload custom font’s to the panels. Each panel can contain 2 different user fonts. This font can contain graphics as wel as a custom font. 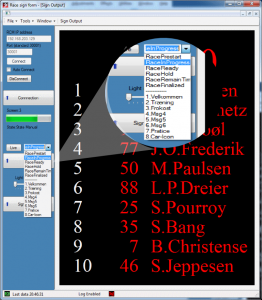 You could upload your club logo as a font, and use it for custom messages between races. The sign can be firmware updated with this build in firmware upgrade feature. The sign has a core system that is never deleted, so if something like a power failure during firmware update, the sign can still answer to update commands, and functionality be restored. If the sign doesn’t respond as expected to your system , it is possible to log the events and send a log file to the RD Sign support team. This will give the support team a valuable tool in the debugging process.